The Wall Street Journal had a "tax report" in its weekend edition illustrating some of the devices used by the elite with sophisticated tax advisers to ensure that theiy can avoid paying as much estate tax as possible. See Laura Saunders. Tax Report: How Twitter Insiders Cut Their Taxes, Wall St. J. (Oct. 12-13, 2013), at B9. Twitter chair Jack Dorsey (36) and largest shareholder Evan Williams (41) and CEO Richard Costolo (49) have been asiduous in "canny estate-planning moves" that "could save [them] a total of at least $115 million and perhaps far more." Id. What are the devices listed? The GRAT is a "grantor-retained annuity trust". Dorsey apparently holds about one-tenth of his Twitter shares in such a trust, as does Williams. GRATs are used to transfer appreciated assets to someone else, without paying tax on the appreciation. The grantor/owner of the GRAT gets annual payments over the trust's life that add up to the value of the original contribution plus a formulaic "return" on that value at an interest rate specified by the IRS, currently around 2%. If the owner outlives the term of the GRAT, he's gotten his original contribution (plus the formulaic return) back and any appreciation on the assets is transferred out of his estate to someone else (usually another trust on behalf of children). it is possible that the actual interest earned on the assets will be substantially higher than the IRS theoretical interest. Thus at the end of the term, the value remaining in the GRAT may still be large, even though the initial IRS calculation suggests that it should have been zero. This remaining value is then passed on to the beneficiary without incurring a gift tax. And, of course, the grantor's estate has only whatever remains of the original contribution value and annual payments. That means substantial gift-and-estate tax savings. The article estimates the tax savings for the GRATs listed in the Twitter IPO filing to be at least $113 million. Gift trusts used by Williams for his Twitter shares may have been set up, the WSJ article suggests, to avoid potentially much higher estate and gift rates upon the expiration of the 2012 estate and gift tax regime. [Congress rather foolishly failed to take the opportunity to reinstate meaningful estate and gift tax regimes, leaving the rich able to pay miniscule taxes (at a rate of 35%) even on humongous estates in excess of the substantial exempted amount.] The article estimates a savings of about $3 million in taxes from the establishment of these trusts. Williams also holds about a tenth of his shares through a single-member limited-liability company (LLC). Such an LLC is a "disregarded entity" for federal income tax purposes so that income on the shares are income to Williams. But the legal entity has extraordinary tax avoidance ability for estate taxes. Because the shares are held through an entity with limited marketability, the value of the entity is determined at a severe discount from the actual value of the shares held by the entity. In the example in the article, if Williams gave shares directly to his children worth $1 million, there would be about $400 thousand of gift tax due. But put the $1 million of shares in a single member LLC, and give the membership interest in the LLC to your child instead and suddenly you can treat this indirect transfer of $1 million of shares as though it is worth, say, only $650 thousand, thus reducing taxes to $260 thousand. The kid can easily unwind whenever needed. Voila--the government is left $140 thousand short but rich capitalist and kid have the same aggregate wealth as before! The article adds another twist--let the gift trust buy those discounted LLC interests with an IOU, putting even more stock in the trust at below market value and further minimizing taxes. Oh, and another caveat--these devices are used with the assets that "people know they won't need.'" Id. Remember that these guys (and as usual, they are mostly guys) are worth many times more than ordinary Americans and so can "do without" several million dollars easily, compared to those ordinary Americans for whom their retirement savings in toto don't approach "several million." So should these gimmicks for avoiding larger liability for estate tax work? I don't think so--they are purely tax motivated, and they depend on tax rules that make them possible so it would be very simple for a functioning Congress to get rid of these planning techniques. (Of course, we do not have a functioning Congress currently. We have a Congress hijacked by extremists who don't give a damn about the future of the country and do give a damn about protecting the wealthy from paying taxes.) The most worrisome of the devices is the "marketability" discount for LLC interests. Congress could rather easily create rules applicable to gift and estate taxes that remove the possibility of market discounts for such LLC creations where membership interests are transferred to related parties. It could similarly eliminate GRATs. Remember, these are essentially entities that have no economic rationale other than tax avoidance purposes and are only utilized by wealthy capitalists in the elite top 2% of the distribution who are already extraordinarily favored under the estate tax. There seems to be no justification whatsoever for allowing them this ready-to-use method of avoiding taxation by creating GRATs or LLCs that hold the shares that are the real assets transferred. It's hard to see any justification for gift trusts, either. It seems that billionaires think they are entitled to it all and think they should be able to run their speculative games without paying much of anything at all in taxes to the government they depend on. And none of this is good for the economy or good for the taxpayers not in "the 1%". Case in point--John Paulson, the notorious hedge fund manager who got a CDO built to his desires with a bunch of iffy subprime mortgages and then took the short side of the bet, making a fortune off the bet against subprimes in the mortgage crashes underlying the 2007-8 Great Recession. See, e.g., Zuckerman, Trader Made Billions on Subprime, Wall St. J. (Jan. 15, 2008). What has Paulson done? He established a new "reinsurance company" in Bermuda in April, that turned around in June and put the money invested in it back into Paulson's hedge funds in New York, as a portfolio of insurance "reserves" to be held to pay off insurance risks that go bad. The result is tax deferment for Paulson and other executives of his hedge fund along with recharacterization of ordinary compensation income as preferentially taxed capital gains. For a discussion of the hedge fund reinsurer gambit, see , e.g., any of the following. The story at Bloomberg has reinvigorated media attention to this issue. Barile notes that these hedge funds are using reinsurance premiums and investing in a very aggressive way, compared to traditional reinsurers". This aggressive position produces a downside if there are low investment returns, especially if there are catastrophes for which they have to pay claims when their investment strategies have produced losses. He says that "it remains to be seen" whether hedge-fund reinsurers are in it for the long haul, since they have a shorter time frame on making greater returns on their money. Looking at this as a global concern, Baker ultimately suggests that the Basle Capital Accord rules should be extended to hedge fund reinsurer operations, "Another area in which the BIS should take a leadership position," he says, "is the role in which reinsurance firms play in hedge fund operations. The tax implications of hedge funds using reinsurance firms in their funds for tax advantages points to the need for more government regulation of this activity." He describes the basic problem as follows: "wealthy individuals invest in private placement offerings of offshore reinsurance companies. These companies, many headquartered in Bermuda, buy insurance policies written by name-brand insurers...and "may then invest its stock issue returns in a hedge fund. ...[That reinsurer] pays no taxes on the trading profits until it sells the fund shares and then the reinsurer is taxed at a lower capital gains tax. The tax savings are passed on to the individual investor. He goes on to say that "The problem ... is that insurers are exempt from registering as investment companies....These reinsurers do not have to make annual distribution of profits as mutual funds do and they are not taxed by the Internal Revenue Service as investment vehicles. ...In short, the activity ... is a method for wealthy investors to reduce their tax burden as a result of a tax loophole. Since these insurance companies are mixing insurance business with investment business, they need more supervision. This is especially true when hedge funds are involved. "[H]edge funds work with reinsurers to reduce tax liabilities for their wealthy clients. ...U.S. hedge fund managers and investors form a tax-advantaged reinsurance company offshore in...Bermuda, which has no corporate income tax. The Bermuda-based reinsurer sends investment assets to the hedge fund to invest. Investors return to the United States with shares of the reinsurer and pay no taxes until the company goes public. At that time, investors [and managers] sell their shares in the reinsurer company and are taxed at a lower capital gains rate. These schemes are worrisome from both tax and insurer regulatory perspectives. "Aside from the tax loophole problem, the real issue in these cases is the added underwriting risk incurred in the process. ... [Hedge funds acting as reinsurance companies] have insufficient insurance expertise.... Much of this activity has stemmed from financial engineering and deal making of the 1990s. ... [W]ithout the bailout of LTCM [Long-term Capital Management hedge fund] by national bank regulatory authorities, many banks and reinsurers might have collapsed as well." So why do it and how does the hedge fund reinsurer gambit work? Remember that these hedge fund execs get a ridiculous amount in compensation in the form of a "fee" (usually 2% of assets under management) and a "carry" (usually 20% of the profits). (The fee and carry are often represented as 2 and 20, but can be much higher for some firms with status, rising to as much as 5 and 50.) Without more, hedge fund managers don't get as much benefit from the claimed treatment of a "profits" partner as private equity fund managers do. Though the managers claim classification as "profits" partners whose taxation is based on their share of the partnership's gains and ordinary income and not as payments of (ordinary) compensation, hedges mainly yield ordinary income so don't act directly as "converter" entities. Private equity fund managers also claim they are "profits" partners whose income should not be classed as compensation but as pass-through shares of the partnership items: in their case, most of the private equity fund's gains will be deferred anyway (for several years at least until the partnership sells the leveraged company) and they claim those deferred gains should be characterized as pass-throughs characterized by the partnership rather than being characterized as ordinary compensation income to them. So for hedge fund managers, gaining deferment (of what is clearly in substance their compensation as managers) can achieve minimal current tax. If the money is cycled through an offshore corporation that pays no taxes, that's even better because it gets preferential rates as well. The deferrment is achieved by waiting to sell the stock, and the sale of the stock is reported as a capital gain. Thus what is really current compensation income is recharacterized, through the reinsurer "conduit" scam, as a deferred capital gain. So hedge fund and private equity managers ultimately both claim to get the best of all possible worlds--their wages from work are not currently taxed as wages at ordinary income rates, they pay no payroll taxes on their compensation, and their compensation is deferred and taxed at preferential capital gains rates. This is so obviously unfair to the vast majority of ordinary taxpayers who pay taxes on their compensation income even before the end of the tax year through the withholding mechanism that Congress should step in with legislation. It seems hard to justify a "profits" interest in a partnership at all: it has been created by the "Wall Street Rule" that gains credence because big-money people claim it is correct. As usual, tax administration eventually mostly went along with it (Rev. Proc. 93-27) and a few court cases (Diamond, Hale) mostly treat the notion of a profits partner who pays no taxes on his compensation as reasonable. Congress could easily legislate away the profits interest and define partner in a partnership for tax purposes as someone who has made a genuine at-risk equity contribution of cash or property to the partnership. There really should be no such thing as a services partner with a "profits" interest who hasn't contributed up front for a capital interest. And all compensation shares to what are currently treated as profits partners could be treated as ordinary income --i.e., compensation currently subject to the income tax and to payroll (Social Security/Medicare) taxation. Insurance companies make a living by doing two things: they assess premiums based on the prediction of the likelihood of events against which they insure—that is called underwriting—and they also make money by investing the premiums that they collect until they have to pay out claims. If they are good at those two jobs, they make a profit. Customers buy insurance from insurance companies to guard against the risk of fire, disaster, or some other calamity. In exchange for paying premiums, the customers shift some of their risk to the insurance companies. Insurance companies also buy insurance. Property and casualty insurance companies pay premiums to reinsurance companies in exchange for shifting some of their risk to the reinsurance company. Sometimes the reinsurance company is also the parent company of the property and casualty insurance company. In that case, the property and casualty insurance company shifts risk to their parent reinsurance company at something less than an arm’s length transaction. Here is where the tax avoidance comes in. Some parent insurance companies set their headquarters in low-tax jurisdictions, like Bermuda. Subsidiary property and casualty insurance companies shift risk to the Bermuda parent. Because of Bermuda’s low tax burden, the Bermuda parent can get a greater after-tax return on their investment activities. As a result, subsidiary property and casualty insurance companies can charge lower premiums for their insurance. They get a competitive advantage over insurance companies doing business in jurisdictions that tax investments. The second setting that we will examine today involves hedge funds. Foundations and other nonprofits are some of the largest investors in the world. The law requires a nonprofit investor that invests directly in hedge fund partnerships to pay the unrealized business income tax, otherwise known as UBIT. The policy behind the law is that tax-exempt entities should not be able to have an unfair advantage over taxpaying entities doing the same thing. To avoid UBIT, nonprofit investors sometimes invest in hedge funds through offshore entities incorporated in lowor no-tax jurisdictions, such as the Cayman Islands or Bermuda. These offshore entities are called blockers. The third setting we will examine today is the compensation of hedge fund managers. Hedge fund managers receive fees from offshore blocker corporations used by nonprofits and foreign investors.Some hedge fund managers elect to defer their income, and deferring income means you pay taxes later, which is the same as a significanttax savings. The IRS has already noted that offshore arrangements using reinsurers for hedge fund managers may be shams that are subject to challenge on audit. See Notice 2003-34 (indicating that "Treasury and the Internal Revenue Service have become aware of arrangements, described below, that are being used by taxpayers to defer recognition of ordinary income or to characterize ordinary income as a capital gain. The arrangements involve an investment in a purported insurance company that is organized offshore which invests in hedge funds or investments in which hedge funds typically invest.") Although the notice says that these purported insurers may be challenged as not insurers because they are not using their capital and efforts "primarily in earning income from the issuance of insurance", and although it states that such arrangements will be subject to close scrutiny that could result in the application of the PFIC rules (leading to current taxation), it has apparently not bothered to challenge any of the big hedge funds' reinsurer companies. Again, why would they be subject to challenge? On the basis that they are not real reinsurers, since the low amount of reinsurance that many provide is the less risky part of the business and provides a buffer to the very high reserves that they retain, sometimes invested solely in a single promoter's hedge funds. And if they are not insurers, they are at the least "passive foreign investment companies" (PFICs) on which shareholders are subject to current taxation on profits. (Or perhaps the IRS might go further and recharacterize the arrangement as a sham , causing the hedge fund executive to have current ordinary compensation income.) In other words, there is good cause to think that for many of these, the tax haven corporation is acting as an offshore tax-avoidance pocketbook for the hedge fund executive, and not really as an insurer. By the way, if you think these hedge fund managers who are making multi-millions and billions from managing other people's assets and hardly paying any U.S. taxes on those huge compensation payments are incredibly smart people who add to the economy's well-being and therefore merit that kind of out-sized pay or because of the returns they bring to people that then invest them in needed projects in the good ole US of A, you need to rethink that. Hedge funds typically pay out very poor returns, when all the expenses and profits to managers are taken into account. Roughly speaking, if the typical fund manager worked for free, and if the investment firms didn’t charge, these masters of the universe would still have underperformed a balanced index since 2003, by roughly 2.5 per cent per year. Andrew Hallam, Think you're smarter than a hedge fund manager?, The Globe and Mail (Feb. 19, 2013) (emphasis added). Billionaire Hedge Funds Most Recent Moves: SPDR Gold Trust, Apple Inc., Family Dollar Stores, Inc., Dollar Tree, Inc.
Jack Lew, former budget director under Clinton and Obama and former Obama chief of staff, answered questions at Senate Finance today in his bid to succeed Tim Geithner as Treasury Secretary. See, e.g., Rubin & Klimasinska, Lew Says He Didn't Know Money-Losing Investment Was in Caymans, Bloomberg.com (Feb. 13, 2013) and other related articles linked below. When he was first nominated, I noted that I found his candidacy somewhat worrisome. While there are a number of considerations that suggest a decently competent person, there are also some suggestions of a person who has lived in the "Wall Street" flow too long and thus falls into line with the typical Wall Street/mainstream economics thinking--thinking which ultimately supports policies that will continue to slide towards oligarchy. The hearing focused on several interesting aspects of Lew's career and investment choices. 1) Investing in the Caymans. Lew made an investment of 50 to 100 thousand in a Citigroup fund based in theCaymans while he was at Citigroup, and claimed that he didn't know it was an offshore investment. He got out of it when he went into government and lost money on it. ME: There we have it--like most rich people, he just didn't care enough to consider closely whehter his investment was in a tax haven country and certainly didn't ponder the negatives . 2) Compensation at Citigroup. Lew got a "bonus" of $940,000 in January 2009 when Citigroup was receiving federal bailout funds. He defended it as being paid in the same way other private-sector employees in similar jobs were paid. ME: But there was a ridiculous racheting up of financial sector compensation during the years when the big banks were feeding at the trough of easy mortgage securitization money and derivative speculation. Shouldn't someone that we hire as the head of Treasury have been more aware of that speculative binge? Or shouldn't that person be at least somewhat ashamed now that such an exorbitant "bonus" (10 times what most Americans receive in annual pay) should have been funded, in essential part, by taxpayer bailouts of his institution? Now, Orrin Hatch (GOP-Utah) tried to make a big deal out of Lew overseeing the Financial Stability Oversight Council in administering the Volcker Rule limiting proprietary trading, saying that "it could lead to an awkward situation in which, in your role as chair of the FSOC, you would effectively be saying to financial firms: 'Do as I say, not as I did.' " Hatch claimed that this issue "bear[s] directly on your qualifications." I'm not so sure that is such a big worry since I think it is advantageous if Treasury has some understanding of how big banks trade, but it is just one more piece of Lew's overall nature of being well-attuned to Wall Street (and not so well-attuned to Main Street). 3) Corporate taxes. Lew suggested in the hearing that Republicans and Democrats could "work together" so that changes in the international tax scheme could lead to lighter burdens on some foreign income of US multinationals. The Bloomberg report notes that he supported a global minimum tax, but indicated that could be nominally territorial, with limits on offshoring income to tax haven countries. 4) Earned benefit programs. Lew is one of those Democrats who is more right of center than the party's base. He still mentions the need for "entitlement" program changes as well as additional revenue increases as a part of "balanced" deficit reduction. ME: This is one of the most disturbing aspects of the Lew nomination. He is pushing the GOP agenda of deficit reduction and "entitlement" reform when instead he should be staunchly defending the New Deal against the oligarchs who want to shrink government, diminish the safety net, end any support for innovative environmental and energy progrms, yet continue to reap benefits from the long-term government subsidies for Big Oil.....We should not tamper with Social Security--and there is no deficit reason for doing so. More on Jacob Lew: Does His Background presage failure to protect New Deal programs when the right hollers about debt and deficits? One of the ways that technology-based businesses like Big Pharma and Big IT companies dealing primarily with intangible assets (patents, copyrights, licenses, information databases) escape paying much in taxes anywhere is their ability to move those assets around almost costlessly and to claim whatever site seems most convenient as their home jurisdiction. Not having any "real" property within a jurisdiction can seem to render them invisible to taxing systems. One example in this country is the way that online sales networks have tried to avoid state taxes by having no physical assets in the state and claiming not to 'do business' in the state. Recently, states have been wising up, in part due to an intensive lobbying effort aimed at pointing out the inherent unfairness in taxing only local businesses with physical stores while their main competitors rake in the tax-free dough. Another example is the way that multinational enterprises (MNEs) with mostly intangible valuables claim to "sell" their essential intangible patents to offshore affiliates in low-tax jurisdictions, thus claiming to move valuable income-producing assets offshore. Since they would in fact never actually sell such essential property to a competitor, the "transfer pricing" mechanisms that the US uses to police such deals by attempting to require a "market price" are inadequate, resulting in offshoring of profits. Offshore captive insurance companies operate similarly, with premiums paid to offshore affiliates permitting an undeserved decrease in domestic taxable income. "Google generates more than $30 billion a year in advertising revenue, including an estimated €1.5 billion, or $2 billion, in France. Yet, like other American Internet companies, it pays almost no taxes in France." Eric Pfanner, France Proposes an Internet Tax, Jan. 20, 2013. France, frustrated with its current inability to tax such MNE IT giants like Google, Facebook and Microsoft, is considering new ways to attack the problem. A report commissioned by President Hollande suggests a tax on internet data collection. See id. Data collected by these companies, the report says, is the "raw material" of the digital economy and is insufficiently captured by current economic analysis. Like the financial transaction tax, which would help to stem rampant speculation by the big banks that puts world economies at risk, a data collection tax on the big data companies would offer some help in stemming the rampant speculation by those companies in personal data. Such data collection may well also prove to put economies--and individuals--at considerable risk, as genetic information, interconnected banking and investment strategies and other data is reached, stored and used. And like the financial transaction tax, a data collection tax is not likely to work very well without OECD cooperation among advanced countries. These are the kinds of issues that Congress should be discussing when they talk about "tax reform"--NOT how to lower the corporate tax rate in the US, which is fine where it is; NOT about how to provide more tax expenditure subsidies to corporations that are already making huge profits (like Oil, Insurance, etc.) but rather about how to ensure that the externalities like pollution, catastrophic risk, and other ills that Big Business has been so good at shoving off on the rest of us get paid for out of business income and how to use the tax system more effectively to cause the economy to work for ordinary folk rather than to cater to the wealth accumulation of the very small percentage at the very very top. eliminate the capital gain preference and increase the estate tax: the combination of preferences for capital income and capital wealth unfairly allows the wealthy to accrue income at very low rates with assets that also permit them to monetize their assets while retaining them to pass along to their heirs at very low rates of taxation. In putting forward my theme of democratic egalitarianism, I have often noted that there is no such thing as an economically egalitarian society--there will always be differentials among people, those differences often relate to social class and the education, privileged upbringing, and networking connections that ensure success for some and deny success to others as well as to innate abilities, so that those differences inevitably translate into some being better off economically than others. Because of those differences, the "powers that be"--i.e., existing concentrations of financial assets, prestige and associated political power among the privileged class at the very top of the income and wealth distribution-- result in redistribution upwards from poor and middle class to the upper crust. And most in that privileged upper-crust think they've acquired it all on the basis of their own merit and that the reason others don't have it is because they are irresponsible, don't work hard enough, don't have a good business sense or are just incompetent. Therefore, I have argued, democratic institutions (government, programs, policies) must target achieving a sustainable economy that provides a decent livelihood for all. They must also prevent inordinate inequality, because huge inequality among the citizenry foils all attempts to achieve either a sustainable economy or sustainable democratic institutions. That means that government policies must focus on creating paths for redistribution downwards from the upper crust to the middle and lower classes, undoing the corporatist top-down approach that has supported class warfare and allowed the wealthy to capture most of the productivity gains since Reagan's presidency. Two government systems can work, on the margins, to achieve some level of downwards redistribution--benefits and taxes. Benefits do so by providing a safety net under those most vulnerable who have never achieved a sustainable economic livelihood--the unemployed and unemployable, the sick, the elderly, the children who have poor schools, poor families, and inadequate shelter, nutrition and opportunity. Taxes do so by taking more from those who have grabbed an inordinate portion of the resource pie and using those revenues to fund benefits as well as infrastructure (human and physical) that supports the efforts by ordinary Americans to achieve sustainable livelihoods. We have been moving backwards on both of these systems. The radical right has spent the last 30-40 years pushing an agenda that ultimately wants to (i) dismantle or radically reduce benefits programs (voucherizing medicare, privatizing social security, cutting back on unemployment, allowing states to reduce medicaid and children's health coverage, etc.) and (ii) eliminate taxes on corporations and the primary source of income of high-wealth individuals through a gradual reduction in progressive rate structure, elimination of the estate tax, elimination of capital gains taxes (and treatment of wealthy people's wages as though they were capital gains, through provisions like stock options and carried interest). Paul Ryan's positions on Medicare and Social Security should be a clarion-call to get out the vote--against the Romney-Ryan ticket-- of every person who does not earn more than $300,000 a year. The Norquist-Koch Brothers-Karl Rove-Ryan-Romney agenda on taxes should similarly cause ordinary Americans who earn less than $300,000 a year to take to the streets and to refuse to vote for any member of the GOP. Recall that the beginning of the current trend towards too little tax revenues and especially too little taxation of the ultra rich was radical reduction of rates with purported base-broadening (such as elimination of the capital gains preference, creation and then ramping up of the alternative minimum tax). As could be expected, lower rates lived on (and were lowered even more by Bush) but much of the base broadening was short-lived: lobbying by the privileged at the top led to a quick return to a capital gains preference and the undoing of the AMT as an inequality leveler. The Bush tax cuts rewarded corporate owners and managers and the wealthy class with extraordinary tax relief, while imposing long-term deficits on the country, behind a cheerful facade of "tax simplification" that was irrelevant for the 70% of the population that uses the standard deduction. There is a third leg to the reduction-of-inequality stool. Tax reform that restores a truly progressive income tax is one leg. Benefit reform that builds on the achievements of the New Deal rather than destroying them is another. The third leg is what some call "predistribution"--paying attention to the means by which the uppercrust has seized all of the productivity gains and reduced the ability of everyone else to have a decent, sustainable livelihood. British Labour leader Ed Miliband has called for predistribution as a new agenda in Britain. See Predistribution: A Big New Idea, Noted, The Nation (Oct. 8, 2012), at 5. What kinds of rights are we talking about? Surely a critical right is the workers' right to collective bargaining (supported by a "yes" vote on Proposal 2 in Michigan that would put that right in the state constitution where it could not be removed by the radical right legislative block). Surely the right of the state to build infrastructure (that will create worker jobs) rather than allowing a wealthy tycoon to corner the market on international bridge crossings in Detroit and hog the revenues for himself rather than allow them to be earned by the people (Proposal 6, vote "no" so that Matty doesn't have veto power allowing him to co-opt public infrastructure for his private profits). Predistribution pays attention to how much ordinary workers are paid compared to how much the managers at the top get out of a company. We should be "pushing local employers to narrow the pay ratio between the top and the bottom ranks of their workforce." Id. For too long, we have acted like it is just fine for the "market" to demand that the wealthy be allowed to exploit communities and workers for their own benefit. We need to say no. Predistribution pays attention to regulations that protect workers--from worker safety to time off to family leave. It disregards the multinational corporations' pleas for laws to suit them and instead asks why we should be subsidizing their ability to move active business assets to foreign countries and leave US workers unemployed. It acnkowledges that we have for too long allowed corporate owners and managers to snow us with their claims that "globalization" and "free trade" worked for our benefit, when in fact these are excuses for offshoring jobs so that the owners and managers can enjoy even higher "rent" profits. As Milbrand says, "It's just not true that all the top CEOs will leave the country unless we pay them whatever they demand." Id. Income and Wealth Disparity Measures--are the richest of the rich hiding their wealth abroad? In the US today, the maldistribution of resources continues unabated. The wealthy take in a larger and larger share of the income, while the rest stagnate or sink into poverty. See, e.g., Dave Gilson & Carolyn Perot, It's the Inequality, Stupid, Mother Jones (March/April 2011) (a great set of charts illustrating the income and wealth disparity in America). As studies by Piketty and Saez (mentioned here in earlier posts on income inequality) indicate, the income for the top 1 percent more than doubled between 1980 and 2010. See Piketty & Saez, Income Inequality in the United States, 1913-1998, 118 Quarterly Journal of Economics 1-39 (2003) (tables updated to 2010 in excel format, March 2012, and available at Saez website, here). Average incomes for the very top 0.01 percent grew at an even faster pace--in 2010 they were more than 4 times what they were in 1980, having grown to an average of $23.8 million annually!. The Great Recession "has hit bottom 90% incomes much harder than the 2001 recession" while the top decile "remained virtually constant." Saez, Striking it Richer: The Evolution of Top Incomes in the United States (Updated with 2009 and 2010 estimates) (Mar. 2, 2012). What was going on in this period? The extreme anti-government, pro-elite right wing and its Friedmania economic ideology were the essential driving forces. Reaganomics became the dominant creed--the more it actually failed, the more its adherents favored doubling down on the medicine of privatization of essential government functions; deregulation of banks and other important quasi government functions, militarization (including huge increases in military expenditures and fabricated rationales for going to war to create a justification for continuing them; and the related goals of cutting earned benefit programs for the vast majority of ordinary folk accompanied by decreasing tax revenues through tax cuts for the rich, pushing so-called "free trade agreements" that furthered the multinationals' globalization goal and allowed them to take their active businesses abroad without paying any penalty, with the result of offshoring jobs and the elite's resources. CEOs decided they no longer needed to feel bad about getting their buddies on the boards to pay them obscene salaries at 3 or 4 hundred times what an ordinary worker made while workers were left without any of the productivity gains that their labor provided. Banksters took over the economy, combining reckless speculation with offshoring, tax shelters, and computerized trading that insured they could trade a step ahead to profit off their customers' orders. All of these ills that led us to the financial crisis and the Great Recession, and the lowered economic expectations of ordinary folk in America can be traced to the so-called "reaganomics revolution" and the hawking by purported think tanks of the free-trade ideology. Saez points out that the recovery from the Great Recession was uneven in the same way that the decades since Nixon have been. While the botton 99% saw an increase in their incomes of 0.2% by the end of 2010, the top 1% grew by 11.6%! Corporate profits and dividends grew strongly in 2011, while wages and salary accruals grew "only modestly" and unemployment stayed very high. Id. The top 1% clearly control most of America's assets. See, e.g., the following chart from Dave Gilson, Who are the 1 Percent?, MOther Jones (October 2011. According to the Levy Institute, which does considerable work tracking wealth, there has been more of a gain in wealth at the top than among the vast majority of Americans. See Edward Wolff, Recent Trends in Household Wealth in the United States: Rising Debt and the Middle-Class Squeeze--an Update to 2007, Levy Economics Institute (March 2010). From 1989 to 1998, mean wealth continued to surge while median net worth rose at a rather anemic pace. Indeed, the only segment of the population that experienced large gains in wealth from 1983 to 1998 was the richest 20 percent of households. At the same time, however, it doesn't appear--at least at first glance--that the wealth gap has been consistently tracking the income gap. Wolff notes that the reasons are not clear for why there was not as much an increase in net worth inequality as there was in income inequality between 2004 and 2007. Id. at 13. But clearly, between 1983 and 2007, those at the top gained the most. [T]he largest gains in relative terms were made by the wealthiest households. Thye top 1 percent saw their average wealth (in 2007 dollars) rise by over 9 million dollars or by 103 percent. The remaining part of the top 1quintile experienced increases from 81 to 142 percent and the fourth quintile by 71 percent. While the middle quintile gained 50 percent, the poorest 40 percent lost 63 percent! By 2007, their average wealth had fallen to $2,200. Id. at 13. 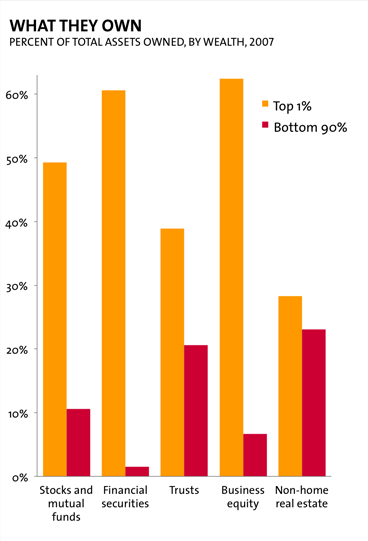 [T]he top quintile collectively accounted for 89 percent of the total growth in wealth, while the bottom 80 percent accounted for [only] 11 percent. Id at 14. A blog (toomuch online) looks at these statistics, and the CRS study on wealth distribution [see Linda Levine, An Analysis of the Distribution of Wealth Across Households, 1989-2010, Congressional Research Service (July 17, 2012) (based on Federal Reserve data)] and asks why wealth inequality appears to grow significantly less than income inequality. The CRS study shows "no significant expansion in the gap between the wealth of the awesomely affluent and the rest of America." Mitt's Offshore Shenanigans: The Bigger Story, Toomuchonline.org (July 21, 2012), though the top 10% continue to own almost 75% of the total wealth and "net worth has become more concentrated in recent decades." CRS study, above, at 4. The share of wealth held by the top 10% of wealth owners grew from 67.2% in 1989 to 74.5% in 2010. Declines occurred in the remaining 90% of households. The share of total net worth owned by households in the 50th to 90th percentile of the wealth distribution fell from 29.9% in 1989 to 24.3% in 2010, and the share of households in the bottom half fell from 3.0% to 1.1%. CRS study, at 4. How could anyone have thought it would be otherwise? After all, millionaires with ample savings fared better than ordinary folk who lost their jobs and blew through their meager savings. Clearly, these super-wealthy do not spend all their increased income. It is extraordinarily hard to spend twenty-three million dollars annually year after year. So what accounts for the fact that we don't see evidence of a huge increase in wealth disparity paralleling the huge increase in income disparity? Maybe the wealth of the super-wealthy isn't being counted in the CRS study? Sure enough, says Too Much, one group isn't included at all--the wealth of the Forbes magazine list of the richest 400 in America, which in 2010 was $1.37 trillion (not chicken feed). See Mitt's Offshore Shenanigans (referencing CNN Money 2010 story referring to Forbes richest 400). And it appears that much of the wealth of the wealthiest elite may not be counted in those statistics because it is being hidden offshore. See, e.g., Stewart, 13 trillion [UK Pound] hoard hidden from taxman by global elite, The Guardian (July 21, 2012). A global super-rich elite has exploited gaps in cross-border tax rules to hide an extraordinary £13 trillion ($21tn) of wealth offshore – as much as the American and Japanese GDPs put together – according to research commissioned by the campaign group Tax Justice Network. James Henry, former chief economist at consultancy McKinsey and an expert on tax havens, has compiled the most detailed estimates yet of the size of the offshore economy in a new report, The Price of Offshore Revisited, released exclusively to the Observer. He shows that at least £13tn – perhaps up to £20tn – has leaked out of scores of countries into secretive jurisdictions such as Switzerland and the Cayman Islands with the help of private banks, which vie to attract the assets of so-called high net-worth individuals. Their wealth is, as Henry puts it, "protected by a highly paid, industrious bevy of professional enablers in the private banking, legal, accounting and investment industries taking advantage of the increasingly borderless, frictionless global economy". According to Henry's research, the top 10 private banks, which include UBS and Credit Suisse in Switzerland, as well as the US investment bank Goldman Sachs, managed more than £4tn in 2010, a sharp rise from £1.5tn five years earlier. Let's recap. Income inequality has grown, so that those at the top of the distribution average in one year what most Americans don't see in a lifetime. Wealth disparity has grown, but official studies like the CRS study don't seem to show it growing quite as fast as income inequality. However, those studies are based on Federal Reserve data, which are understandably incomplete. They don't count the richest 400, and they don't count assets that may be hidden in offshore jurisdictions where they have been protected by banking secrecy. If we understand the way disparity has grown during the last decades of policies that have heavily favored the rich, then we have the basis for a conversation about what kinds of policies make sense--and specifically, what kinds of tax policies make sense. The philosophy of democratic egalitarianism suggests that those policies should strive to reduce the gap between classes rather than supporting increasing the gap, based on the recognition that large income and wealth gaps among citizens destabilizes democracy and pushes towards oligarchic/plutocratic forms of government. Estate taxes that recognize death as the appropriate time to tax the ultra wealthy who generally can avoid taxes in life are a start. Increasingly higher rates on top incomes so that the top rate continues to increase proportionately to the outside incomes of the super-elite would be another. Cracking down on offshore assets--through elimination of the idea that a company in the Caymans is anything other than a sham--would be another important step. These days, one hears a great deal from politicians on the right about how a corporate tax "overhaul" is needed because our taxes are "too complex" and/or "too anti-competitive" or because our tax rates are "too high". The same GOP politicians who whine and whimper about how huge the deficit is, and accuse President Obama of driving our country to ruin with the deficit are willing to lower the tax burden paid by highly profitable corporations considerably (thus increasing the deficit and adding to regressivity of the tax system)--so long as they are appeasing their multinational constituency, the huge corporations who are the new providers of campaign funds and the new decisionmakers in elections--even though the corporate entities have no vote. Claims of revenue neutrality are generally little more than PR cover for corporate giveaways. Republican Senator Robert Portman says he will unveil a new proposal soon that will cut taxes for multinational companies' repatriated offshore profits--i.e., a permanent tax holiday for multinationalsm as a first step towards a very MNE favorable move to a territorial tax system--that will remedy "an inefficient and complex maze of tax preferences". See, e.g., Kathleen Hunter, Portman Corporate Tax Plan to Include Low Repatriation Rate, Bloomberg.com (Feb. 1, 2012). Portman claims this huge tax cut for the high and mighty MNEs (and their managers/owners) is needed because they "pay a very steep tax bill if and when they choose to bring their money home." Ludicrous. There is a very generous foreign tax credit provision that allows many MNEs to reduce their taxes to near zero anyway. Further, the deferral they are allowed on active business income gives them the time value of money benefit. Most of what foreign corporations want to do is allow their taxes on non-US income to reduce their taxes on US income--which is a kind of subsidy for offshoring that costs US jobs. And of course, as I've noted in earlier posts on tax holidays and proposals for a territorial system to replace a worldwide system, corporations hold more money overseas when they think there is a good chance that their buddies (or "bought pols"?) will give them the tax break they have been lobbying for--so these proposals encourage corporations to engage in the activity that these proposals say they are addressing, thus giving them more ammunition to get the change they want. Portman, of course, says he wants to "streamline" the corporate tax and lower the rate to 25%. We have a statutory rate of 35% now and most corporations that pay taxes (which are not by any means all of the corporations that make significant profits) pay less than 25%. If we lower the statutory rate to 25%, it is quite likely that most corporations that actually end up paying taxes will be a smaller number than with the 35% rate and at a much lower rate--probably around 10-15% instead of 20-25%. Of course, what the result will be--as it was in the 1986 tax reform that lowered rates for ordinary income and ended a number of problematic tax preferences such as the capital gains preferential rate--is that the lower rates will stay, and all of the loopy tax preferences (and more) will be reenacted within a couple of years under heavy lobbying for the same by the corporations that benefit from this round. Dave Camp, Michigan Republicans and Chair of the House Ways and Means Committee, wants to exempt 95% of overseas profits. Is there merit in this drumbeat of (lobbyist-induced) calls for "corporate tax overhaul legislation"? The simple answer is no. Most complexity in the code is there for one of two reasons. The most likely reason for complexity is the creation of tax preferences heavily lobbied for by corporate lobbyists. One example is the so-called "domestic production activity deduction" that lowers the tax rate by 9% for most industries (even ones that don't really produce anything) and 6% for natural resource extractive industries. There are tax breaks on top of tax breaks for the resource industries, of course, that get numerous special benefits throughout the Code, while joining in various coalitions that lobby AGAINST even extraordinarily modest support for green industries (such as reasonably low cost loans for solar power). The second main source of complexity is the clear need for specific anti-abuse provisions to undo the harm done when corporations use what can most charitably be called aggressive and inventive interpretations of Code provisions--often ones that are hyper-literal in nature (the kind of analysis that allowed the Bush Treasury to redefine what "exchange" means in the reorganization provisions in order to allow taxpayers to manipulate the allocation of consideration to create a hitherto unrecognizable tax loss in the reorg transaction) or turn the Code's clear textual provision on its head (look at the briefs for the defendant--or for that matter the lousy statutory interpretation in the district court opinions-- in the Black & Decker contingent liability shelter case, where Black & Decker argued for application of a provision in section 357(c) (which says explicitly that it applies only where paragraph one of that provision applies) in a context where paragraph one did not apply). As a result of the contingent liability shelters, Congress added various Code provisions, including section 358(h) (having to do with the basis for corporate assets in transactions with significant liabilities) and section 357(d) (having to do with calculating the amount of liability assumed). Complexity, in other words, is not an evil in itself. Sophisticated taxpayers aren't harmed by complexity, and in fact complexity is needed to provide sufficient detail to prevent sophisticated taxpayers (with the help of their tax advisers) from cheating. There is generally less complexity in provisions that are relevant for unsophisticated taxpayers, though it is more clearly an obstacle to good tax compliance behavior there. Competitiveness is used so frequently that it seems doubtful that anybody really knows what they mean by it. If one company destroys a union and is able to pay their workers lower wages as a result, then a company that produces a similar product will claim that "competitiveness" requires that they be allowed to do the same. Of course, another approach would be for the company that retains an active union, and continues to provide pension and health care benefits could lobby Congress to enact stronger laws protecting worker rights to pension and health care benefits. In other words, competitiveness is consistently used as an argunent, when it comes to corporations, for taking away benefits to workers, communities, states and the nation for the benefit of the corporations. Competitiveness could just as easily be used to argue for maintaining programs, procedures and benefits for workers, communities, states and the nation by considering what would be necessary to buttress the system that supports those benefit levels. And in fact that view of competition--that we are competing globally to create both profitable companies AND a secure and well-paid workforce that can support a healthy economy that can in turn support a quality of life in all dimensions--would lead to different decisions not only about taxation but also about anti-trust, excise taxes, trade treaties, environmental protection, and many regulatory projects. Furthermore, competitiveness is often used as an argument in the abstract when the main competitors are both US based companies. There, the argument for reducing taxes to enhance competitiveness is at its weakest, but few competitiveness arguments reveal just how the competititon is playing out even on a globalized playing field. The 1986 tax reform act is a frequent reference these days when people talk about amending the Code generally and specifically about amending the corporate tax provisions. But the context for that act's passage was quite different. Individuals were taxed at rates that were reasonably progressive--with a top rate at 70% (though the brackets could probably have been better defined to differentiate among top income recipients). Further, the 1954 Code had built up a plethora of tax preferences (especially useful to the rich) and the Congress had realized that the preferential capital gains rate was wreaking havoc on sensible provisions because of the arbitrage opportunities it created. Thus, there was room for "base broadening" (removing ill-advised preferences spread throughout the 1954 Code) as a means of paying for "rate lowering" (lowering the fairly high rates about half, without costing the fisc because of the higher amount of income on which those rates would be charged). We are not in the same situation today. We have very high deficits because of an economic crisis caused by two interwoven problems--(i) the lax regulatory oversight of 40 years of Reaganism, which permitted the financialization of the economy and led to excessive incomes for people at the top (managers and owners, hedge fund and equity fund managers, and speculators generally) and excessive debt for banks and especially people not at the top (because of their stagnant or reduced incomes in the face of growing costs, caused in part by the relaxation of regulations and anti-trust activity coupled with the anti-union attitudees and activity); and (ii) the success of a radical right-wing fringe in characterizing government and business as having adverse interests and progressive programs supporting social well being (from Social Security to Medicare to Medicaid to (modest) heatlh care reforms intended to reign in the cost of medical care to unemployment benefits to efforts to reign in contracts of adhesion in the consumer credit markets) as "unmerited" "entitlements or costly and anti-competitive regulation of businesses that counters the "free market" that will ensure "growth and jobs". The result of the rhetoric is a citizenry that is ignorant of the actual income distribution, tax burdens, and impact of government spending on jobs and the health of the economy. The result of the 40-year "reaganomics" effort from the right to cut regulations, cut taxes, privatize and militarize is that this is no context for rate reduction but in fact a context in which those who can afford to do so--for sure those individuals and households in the top two quintiles of the income distribution that comprise the upper middle class and the upper class and all profit-making corporations--should be paying taxes at HIGHER rates, not lower rates. It should be noted that President Obama--who is at best a middle of the roader on tax issues--also is said to plan to propose an "overhaul of the U.S. corporate tax system" in connection with his budget plan for FY 2013 that involves lowering rates and base broadening. See Steven Sloan, Obama said to propose corporate tax overhaul next month, Businessweek.com (Feb. 2, 2012). Again--lowering the rate is a bad idea. Lowering the rate without base broadening is a stupid idea. But the kind of base broadening that is included, if such a proposal eventually passes, matters an awful lot. The problem is that if Obama proposes such a reform, the GOP won't support it unless the "base broadening" is essentially inconsequential and can be undone easily later or affects only little guys and not the big-monied lobbyists. Thus this looks like another of those initiatives from the White House that play into the right's agenda and do little to advance any progressive idea. Bloomberg reports today that the IRS is auditing Google's offshoring of profits. See Drucker, IRS Auditing How Google Shifted Profits Offshore to Avoid Taxes, Bloomberg.com (Oct. 13, 2011). "The agency is bringing more than typical scrutiny to how the company valued software rights and other intellectual property it licensed abroad, said the person, who requested anonymity because the audit isn’t public. The IRS has requested information from Google about its offshore deals after three acquisitions, including its $1.65 billion purchase of YouTube, the person said. The transfer overseas of these kinds of rights rights has enabled Google to attribute earnings to foreign units that pay lower taxes . Google, owner of the world’s most popular search engine, has cut its worldwide tax bill by about $1 billion a year using a pair of strategies called the “Double Irish” and “Dutch Sandwich,” which move profits through units in Ireland, the Netherlands and Bermuda. Google reported an effective tax rate of 18.8 percent in the second quarter, less than half the average combined U.S. and state statutory rate of 39.2 percent. " Id. After being alerted to Google's use of income shifting through media attention to the issue, France is also reviewing Google's income shifting between its French and Irish subsidiaries, according to the Bloomberg article. This audit, however, takes place against the backdrop of a 2003 "advance pricing agreement"--essentially, a contract between a taxpayer and the IRS that "settles" the tax treatment of a transaction that the taxpayer expects to undertake. The IRS has already approved a major part of Google’s strategy. In 2006, the agency signed off on a 2003 intracompany transaction that moved foreign rights to its search technology to an Irish subsidiary managed in Bermuda called Google Ireland Holdings. That deal -- known as a “buy in” in tax parlance -- meant subsequent profit overseas based on those copyrights has been attributed to foreign subsidiaries rather than to Google in the U.S. where the technology was developed. The IRS approval came in an accord known as an advance pricing agreement. Id. In my view, advance pricing agreements --a recent introduction in the 'tax compliance' toolkit--are problematic in a democratic tax system. Only taxpayers with considerable dollars at stake can engage in the process, which allows them to "fix" in advance what their tax obligations are regarding particular business plans. The potential for agency capture, always present, is enhanced in this setting. Tax administrators are less adept at foreseeing likely ancillary consequences of a particular decision than the taxpayer itself and, worse, they may be "captured" by their proximity to the taxpayer and lack expertise or in-depth understanding of the issues sufficient to challenge the taxpayer's assumptions. The decision made ahead of time is likely based on sketchier information than an after-the-fact audit. Further, those negotiating such agreements may be less inclined to take an strong position vis a vis the taxpayer than those involved in enforcement and litigation decisions later in time would be. While changes in administration likely affect the government's commitment to, and interest in, both enforcement decisions and advanced pricing agreement decisions, one would expect that an administration that had made a point of being "business-friendly" would be more likely to enter into taxpayer-favorable advanced pricing agreements whereas one that had a more guarded view of business might be more interested in strong enforcement. It's worth noting that the big IT and pharmaceutical companies that find it easiest to shift income offshore due to their intellectual property patents are also the ones pushing hardest for a so-called "repatriation tax holiday" on those offshore earnings. They've kept billions offshore and now want to be able to dole it out in executive bonuses and shareholder buybacks little tax. They often have the profits go to offshore tax haven countries, so this is income that has very little foreign tax paid on it either. As I've noted in earlier posts on repatriation (check the category index or just scroll back over the last few months), executives bonuses due to lower tax bills just adds to the outsize compensation those executives receive, while shareholder buybacks just diversifies their portfolios with little likelihood of expansionary impact on the US economy (especially if the diversification results in purchases of emerging market instruments instead of domestic ones). In a recent posting, I commented further on the lack of arguments supporting the corporatist lobbying drive for another "repatriation tax holiday" for multinational corporations that have stashed more than a trillion abroad (often through gimmicky transfers of intangible property such as rights to patents developed in the United States). See Repatriation Holiday Lobbying--Money Speaks (Oct. 3, 2011). The reasons are manifold. Corporations today are not cash-strapped--they've got lots of cash in the US too. And even if they need cash that is currently offshore, they can borrow against that cash at exceptionally low rates today. So they aren't investing in expansion that would create new jobs for lack of cash--they are not investing in expansion for lack of customers. The middle class is collapsing, after four decades of reaganomics have steadily worked to erode unions and the empowerment they offer workers, leaving worker wages in decline while their bosses roll into the ranks of the superrich on their newfound ability to take an undue share of the companies' productivity gains. Even when money is actually brought back (rather than already resting in US bank accounts), it is most likely to be used to pay even higher performance bonuses to top managers and to pay for dividends and share buybacks for shareholders. And those shareholders are most likely merely to use it to make new secondary market share purchases--resulting merely in a net change in their portfolios--not direct funding of new enterprises. Much of those secondary market investments are likely to be in emerging markets rather than in the United States. Most telling is that the very fact of one tax holiday means that corporations will inevitably plan for and conduct business assuming future tax holidays. It is ikely that planning for this current lobbying effort began on the day Congress passed the 2004 Jobs Act! What that means is that the tax holiday itself encourages even more of the very offshoring activity it claims to be amerliorating. Corporations will use gimmicks to move and stash away even more money offshore to avoid even more current taxes, in the hopes that there will be a further tax holiday that will allow almost zero taxation on those repatriated profits. That certainly happened after 2004--the companies that had been good citizens and had regularly repatriated cash found themselves losers compared to the bad citizens that had used offshoring to avoid taxation. More of the good citizens then became bad citizens, and the amount of offshore cash has grown much faster since the 2004 repatriation holiday than before. And our experience with repatriation tax holidays was a telling one. Corporate lobbyists worked hard to get the misnamed 2004 "American Jobs Act" passed with a very low tax rate for repatriated funds. Yet it resulted in very little job creation. In fact, a new study by the Institute of Policy Studies addresses what it calls the "dangerous myth" that "corporate tax cuts create jobs" and the "disastrous results" of the 2004 tax holiday. It reminds us that a government report found that 12 of the top repatriators brought home $100 billion (a third of the total repatriated under the earlier provision) and yet laid off 67,000 workers in the two years after the windfall. Further, the 2004 holiday allowed 843 companies to use $312 billion in repatriated funds while avoiding $92 billion in taxes. The worse factoid of all is the one that shows that U.S. taxpayers "provided a huge subsidy to corporations that destroyed jobs": 58 corporations that accounted for about 70% of the repatriated funds cut almost 600,000 jobs. Report at 6-7. See America Loses: Corporations that Take 'Tax Holidays' Slash Jobs, Institute for Policy Studies (Oct. 3, 2011) (summary, with link to full report). The report is clear in its description of the way US corporations shift profits overseas and then lobby for even lower taxes. Drug companies — and many other companies as well, especially in the technology sector — don’t just make profits overseas. They shift profits overseas. The process has become lucratively routine. One example: A U.S.-based corporation begins the process by having a foreign subsidiary register its patents in countries like Luxembourg that do not tax income from intellectual property. The subsidiary then charges its U.S counterpart a high price for use of the patents. These high royalty fees, coupled with the costs of research, marketing, and management, allow the U.S. operation to report to the IRS an artificially small profit — or even no profit at all. With no appreciable profit to report, the U.S. operation has no appreciable corporate income tax to pay. The company’s actual profits sit undisturbed with the overseas subsidiary. Report at 11. The report also scorns the lobbying efforts of WIN America, which has spent more than $50 million lobbying for the tax break, which would cost the fisc around $80 billion in lost revenues. Report at 9-11. WIN America--a coalition of 18 publicly traded corporations and 24 trade associations, including the U.S. Chamber of Commerce--has "hired 42 former congressional staffers who worked for the House Ways and Means Commitee or the Senate Finance Commmittee". Report at 9. It goes on to rep9ort on the way individual members of the coalition have lobbied for the tax break (e.g., Pfizer's sponsoring a favorable section on 60 Minutes) and cut jobs (e.g., Duke Energy's cutting 10,000 jobs, probably as a result of its 2006 merger with Cinergy in the U.S., contributing to the North Carolina Democratic Party and then, shortly after getting support for repatriation from the Democratic governor of North Carolina and its Democratic Senator Kay Hagan). For other commentary, see also John Carney, Corporate Tax Holidays Might Not Create Jobs, CNBC (Oct 4, 2011) (commenting on the IPS report as well as the Heritage Foundation report discussed below). The WIN America coalition was undoubtedly taken by surprise when the right-leaning Heritage Foundation came out with its own report, a "backgrounder" on taxes that condemns the repatriation tax holiday idea as not doing much to create jobs: J.D. Foster & Curtis Dubay, Would Another Repatriation Tax Holiday Create Jobs? (Oct. 4, 2011). The Heritage Foundation report acknowledges that "if another repatriation tax holiday were enacted, one should expect a similar result as last time: specifically, a surge in repatriations and little appreciable increase in domestic investment or job creation." And it cites the reasons one would expect--today's multinationals that have money to repatriate are not cash-strapped: any investments that they need to make for business expansion purposes (that would create new jobs) they can do readily without needing a repatriation tax holiday to grease the skids. By the way, the Heritage Foundation is resisting repatriation because it wants the big prize--an overall cut in the corporate tax rate and a shift from our current system of taxing worldwide income (after tax credits for taxes paid elsewhere) to a territorial system--and it doesn't think repatriation will be treated as a step in that direction. Those Heritage-supported tax policies would result in even more offshoring and even less corporate tax contribution to the fisc, which is already terribly low at around 2-3% of GDP. Not surprisingly, the WIN America coalition struck back today, with a press release attacking its ordinary ally for not supporting the repatriation tax holiday drive: Fact Check: Heritage's Flawed Study Ignores Their Previous Support for Repatriation (Oct. 4, 2011). The coalition has three arguments: (1) Heritage said something different back in December 2010, (2) other studies say repatriation will create millions of jobs, (3) the 2004 Jobs Act really did work in spite of what these other studies claim because the firms themselves say they created jobs, and (4) lots of people support repatriation. None of these arguments hold water. The coalition first complains that a December 2010 Heritage study concluded that repatriation would "provide additional liquidity" that would increase shareholder wealth allowing them to make "new investments" and would permit the firms to finance current operations, reducing their need to borrow working capital. Let's parse this out. The primary reason that doesn't make sense today (if it ever did, which is dubious) is, as the Heritage Foundation's current report points out, that US firms are not cash strapped. They don't need more liquidity to be able to make investments or finance their current operations. They probably don't even want to reduce loans that are at historically low interest rates any more than they are doing. And shareholders' "new investments", as noted above, are just a move from one portfolio investment to another--they are not investments that encourage entrepreneurs or go to the working capital of companies but just a result of secondary market purchases. Very little of that does much for the US economy or anything for creating new U.S. jobs. WIN America counters that the August 2011 study done for the U.S. Chamber of Commerce by Douglas Holtz-Eakin, The Need for Pro-Growth Corporate Tax Reform, claims that a repatriation tax holiday will "speed the pace of economic recovery, increasing GDP by roughly $360 billion and creating approximately 2.9 million jobs" because repatriation tax holidays are "a private-sector approach to stimulus." That's quite simply balderdash. These same kinds of pie-in-the-sky claims were made about the disastrous 2004 repatriation tax holiday, and they were proven wrong then. They are based on the same bad economics now, the economics that says that "the high U.S. [corporate tax] rate harms economic growth, the amount and quality of U.S. investment, and the wages of U.S. workers." That claim is simply unsupported--the U.S. is a tax haven, a reasonable amount of taxes will never discourage a business from expanding its business when it thinks that expansion is going to be profitable and it has the money to do it. It is in fact this same school of economic thought that has given us the Laffer curve, the "rational man" calculations, and the rest of the Hocus-Pocus economics enterprise that treats rigidly unrealistic assumptions as God's Truth to justify an ever-increasing share of corporate profits going to managers rather than workers. WIN America then argues that 23% of the 2004 repatriated funds went to job creation and should be considered a great benefit to the economy. That number is derived from a survey of tax executives--essentially self reporting on the result of the company-favorable tax repatriation holiday, so it is not only a very low return on the high tax cost of the repatriation tax holiday, but also one that must be evaluated with some acknowledgement of the fungibility of money and the ability of firms to claim that job creation and investment that they would have done anyway was done "because of" the repatriated funds. WIN America concludes with quotes from lots of people (probably written by WIN America or one of its army of lobbyists, don't ya think?). These quotes just repeat the desired sound bites -- "bringing the money home" will "create jobs and re-invest in America" (GOP representative Gregory Meeks, Sept. 9, 2011); "let's bring those dollars back"... and "companies outght to put it into workforce training or they ought to put it into research and development" (GOP Ohio Gov. John Kasich, Sept. 14, 2011). And so on. In 2004, corporate lobbyists successfully lobbied for a doozy of a corporate tax break--after already getting years of tax deferral on their offshore profits (often profits that should have been taxed in the US, for which companies had dreamed up transfer pricing schemes to move the profits offshore, such as selling IT properties to their offshore subsidiaries at a claimed third-party comparable price, even though they would NEVER really sell it to any third party so it was truly priceless), they got added to the deferral tax break a near-zero 'repatriation' tax break. As CTJ notes (see below) this was a downright ridiculous reward to the very corporate tax dodgers who had intentionally kept profits offshore to keep from paying tax and then paid an army of lobbyists to get them the tax break they wanted to bring it back. The republicans in control of the House and Presidency at the time claimed it would be a big job booster--they even named the disastrous bill that enacted that and myriad other corporate tax breaks (the wish list that corporations had been vying for going on 20 years) the "American Job Creation Act". HAH! The joke was on Congress and the workers who bore the brunt of the job cutting by these same corporate giants. Of course, the bill did nothing of the sort. Some of the biggest repatriation dollars went to share buybacks (ie, benefited the wealthiest amongst us that make up the investor class) while tens of thousands of workers were laid off. Hewlett-Packard was a prime example. Repatriation was a flop,that is, for everybody except the managerws and wealthy investors who own most of the financial assets in the country and are pushing the corporatist agenda that is dominating the GOP and much of the blue-dog Dems these days. Repatriation lost money in gobs for the Treasury, adding to the deficit. It cost jobs, since the multinationals are all thinking short-term profits that can most easily (lazily) be achieved by cutting workers and getting big share prices. It supported the continuing 12% growth rate in CEO pay while the workers' pay stagnates or declines. It had a negative impact on the future rate of offshoring of profits, since even the 'good guy' companies saw the benefit to the 'bad guy' companies that had hoarded profits abroad, and the measurable result of the 2004 repatriation holidy was even more hoarding abroad. Those hoarders are now demanding their (nearly) tax-free repatriation of their hoard. Congress and Obama would be fools if they give it to them. It hasn't got anything to do with having enough money to invest in expansion of the business. There's cash floating around multinationals in the US as well as abroad, cash that they aren't using to reinvest. they won't use the additional cash to reinvest either. They'll pay it out to shareholders, who are much more likely to take their payment on their secondary-market purchased shares and buy emerging market shares than they are to fund a venture capitalist firm or a startup entrepreneurial firm or buy shares in an IPO of an entrepreneurial firm. Remember, ONLY directly purchased shares from a company go to aid that company's ability to expand its business. Secondary market purchases of shares just trade cash flows between rich guys. Citizens for Tax Justice is trying to spearhead a citizens' campaign to tell Congress to say no to the corporate lobbyists on this issue. Reprinted below is the CTJ release. Read it. Call your senators and representatives and tell them not to be stupid. Ultimately, the people in this country are going to realize that selling the economy to multinationals who lay off workers without a qualm is not good for workers and is not good for the economy. Call this number to be connected to your members of Congress. A “repatriation holiday,” which has been proposed by some Republicans and Democrats in Congress, would remove all or almost all U.S. taxes on the profits that U.S. corporations bring back to the U.S. from other countries, including profits that they shifted to offshore tax havens using accounting gimmicks and transactions that only exist on paper. 1. Another repatriation holiday will cost the U.S. $79 billion in tax revenue according to the non-partisan Joint Committee on Taxation. 2. Another repatriation holiday will cost the U.S. jobs because it will encourage corporations to shift even more investment offshore. 3. The repatriation holiday is an amnesty for corporate tax dodgers because those corporations that shift profits into tax havens benefit the most from it. 4. Congress enacted a repatriation holiday in 2004, and the benefits went to dividend payments for corporate shareholders rather than job creation, according to the non-partisan Congressional Research Service. Many of the corporations that benefited actually reduced their U.S. workforce. For more information, see the recent post from Citizens for Tax Justice on one senator’s repeated flip-flops related to the repatriation holiday. Thanks to AFSCME for providing the toll-free number to enable constituents to get in touch with their members of Congress regarding this critical issue.